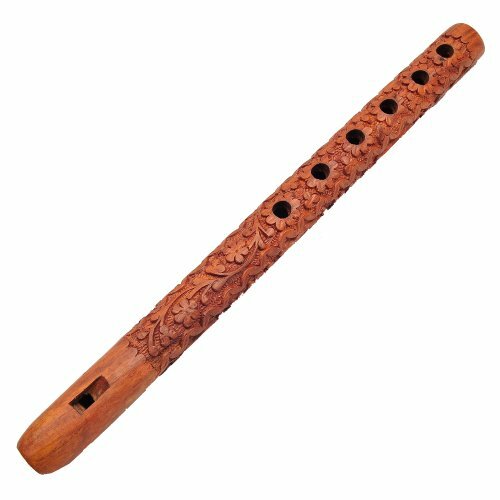 The Indian flute, also known as the bansuri, is a flute of the Indian Subcontinent made from a single hollow shaft of bamboo with six or seven finger holes. An ancient musical instrument associated with cowherds and the pastoral tradition, it is intimately linked to the love story of Krishna and Radha, and is depicted in Buddhist paintings from around 100 AD. The North Indian bansuri, typically about 14 inches in length, was traditionally used as a soprano instrument primarily for accompaniment in lighter compositions including film music. The bass variety (approximately 30", tonic E3 at A440Hz) pioneered by Pt. Pannalal Ghosh, and elevated to heights of global renown by the brilliance of Pt. Hariprasad Chaurasia has now become indispensable in Hindustani Classical music for well over half a century. Bansuris range in size from less than 12" to nearly 40". The size of a Bansuri affects its pitch. Longer bansuris with a larger bore have a lower pitch and the slimmer and shorter ones sound higher. NB: This is a folk music instrument and is handcrafted by the artisans of village India. The folk music instruments are usually meant for sale in the rural local markets. The artisans use very simple and age old tools to make folk music instruments. Almost all folk music instruments therefore lack the finesse that we often see in classical instruments. Flute made in bamboo wood. Grade - hobby and fun. Crafted by music instrument artisans of Bareilli in north India. If you have any questions about this product by ShalinIndia, contact us by completing and submitting the form below. If you are looking for a specif part number, please include it with your message. Bansuri, Professional Flute in G, 24.75"